Days after the new framework designed by Telecom Regulatory Authority of India (TRAI) to ease subscribers in choosing their favourite channels went into effect, Tata Sky has detailed as many as 14 regional packs that it offers under the latest regime. The new regional packs are designed for subscribers watching content in Bengali, Gujarati, Kannada, Malayalam, Marathi, Odia, Tamil, and Telugu languages. 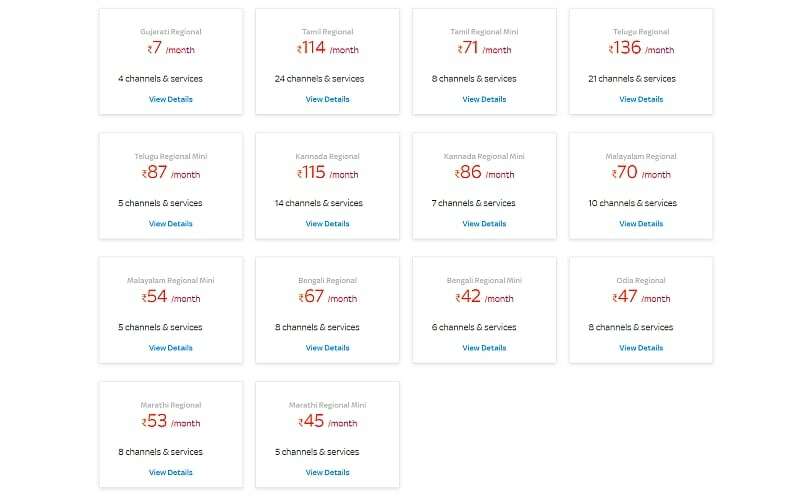 The DTH service provider is offering the new packs at a monthly charge of as low as Rs. 7. Competitors such as Airtel Digital TV and Dish TV have already detailed regional packs for their respective subscribers. The new regional packs can be found on the company website. As per the listing on the Tata Sky website, there are 14 new regional packs to offer channels such as Zeek 24 Kalak, News18 Gujarati, Raj TV, Star Vijay, Sun News, Sun TV, Zee Tamil, and Colors Marathi among others. The packs start at Rs. 7 and go up to Rs. 136. Tata Sky is offering the Gujarati Regional pack at a monthly charge of Rs. 7 with four distinct channels, whereas South Indian viewers can get the Tamil Regional pack at Rs. 114 per month along with 24 channels. There is also a Kannada Regional pack with 14 channels at a monthly charge of Rs. 115. Likewise, the Malayalam viewers can pick the Malayalam Regional pack at Rs. 70 for 10 channels. It is worth mentioning here that depending upon your package, an additional Network Capacity Fee (NCF) may be charged over the pack price. Tata Sky has also listed the Telugu Regional pack at a monthly charge of Rs. 136 along with 21 different channels. There are also specific mini regional packs for Bengali, Kannada, Malayalam, Marathi, Tamil, and Telugu viewers. You can pick any of the listed regional packs from the Tata Sky website after signing in with your credentials or via their official mobile app. You can also contact the company’s customer service to choose the regional packs. The new regional packs come days after Tata Sky added the ability for its subscribers to build their own channel packs. The operator offered a three-step process to make it easy to pick any specific channels. Apart from the a-la-carte option, Tata Sky offered a dedicated pack selection portal. Tata Sky is also offering consumers with an FTA Basic pack that brings 100 channels as well as an FTA Promo Pack with 194 channels. Furthermore, there are various add on and mini packs that can be added to the existing bouquet of channels.